Yesterday was the best and most unforgettable day. 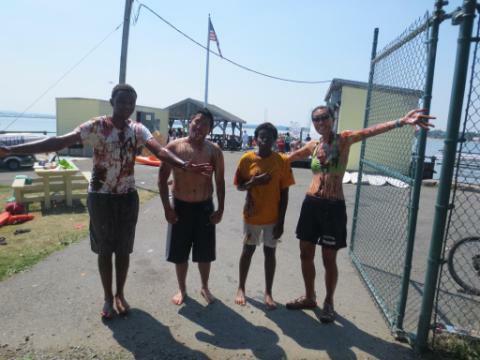 We had an ice cream toppings fight along with all the kids at McDonough Sailing Center. It was soooooo much fun and I really enjoyed myself. Everyone was covered in chocolate and had sprinklers and caramel all over them. They had ice cream toppings everywhere on the dock, it was pretty slippery and nasty. I had chocolate all over my head. I looked like a disgusting sundae. I felt like all the toppings would not come off. But, luckily jumping in the ocean cleaned everything off. The water was really dirty and disgusting. It was so much fun and I really enjoyed it. I wish that more topping fights that could have happened !